Here's a pretty awful story that was revealed earlier today, via Buzzfeed: "Steven Miles 17, killed Elizabeth Thomas at his family’s home in Oxted, Surrey, in January. He pleaded guilty at Guildford Crown Court on September 9th. The Press Association reported that Miles, who was 16 at the time, stabbed Thomas in her head and back before cutting off her legs and arm, wrapping the body parts in clingfilm, and placing them in bin bags. PA said the boy had used tools and saws from his father’s tree surgery business to cut up Thomas’ body. Guildford crown court heard how the teen was a fan of horror films and Dexter, the TV series about a fictional forensics expert who is a secret serial killer. Lewis Power of the defence said: “This was a truly gruesome killing ripped from the pages of a hit TV script. 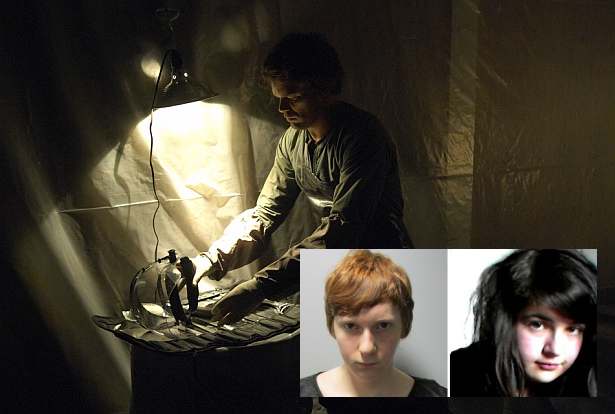 The evidence points to the defendant trying to emulate the actions of the character Dexter, who he idolised. Psychiatrists declared that Miles is not schizophrenic, and therefore the defence of diminished responsibility could not be claimed." Our opinion: Is a television program like Dexter to blame? Of course not. If he was a "copycat", or "truly obsessed" with Dexter's character, he wouldn't even commit this awful crime. Fans of the show understand why.